The term Blue Moon has at least three different meanings. One is a common phrase for a rare event, that really has little to do with the moon itself. Another is a description of the apparent color of the moon, which is frequently yellowish and rarely bluish. Full moons are given names in folklore, and two definitions of blue moon are a name for a rare full moon that does not have a folk name. One modern blue moon definition is for a second, extra full moon that occurs in a calendar month. The older definition of blue moon is for an extra full moon that occurs in a quarter of the year, which would normally have three full moons, but sometimes has four. Oddly, it's the third full moon in a season that has four which is counted as the "extra" full moon and named 'blue moon'. The origin of the term Blue Moon is steeped in folklore, and its meaning has changed and acquired new and interesting meanings and nuances over time. The earliest known recorded usage was in 1528, in a pamphlet entitled Rede Me and Be Not Wrothe: "Yf they say the mone is belewe, we must believe that it is true". This implies the expression had a meaning of something that was absurd, and bears close resemblance to another moon-related adage first recorded in the following year "They woulde make men beleue ... that ye Moone is made of grene chese". The most obvious meaning of blue moon is when the moon (not necessarily a full moon) appears to a casual observer to be unusually bluish, which is a rare event. The effect can be caused by smoke or dust particles in the atmosphere, such as happened after forest fires in Sweden in 1950 and Canada in 1951 and, notably, after the eruption of Krakatoa in 1883, which caused moons to appear blue for nearly two years. The older meaning of blue moon to name an extra full moon, as was used in the Maine Farmer's Almanac, was the third full moon in a quarter of the year when there were four full moons. (Normally a quarter year has three full moons.) The division of the year into quarters for this purpose has the dividing line set between March 21 and March 22. This has to do with the rule for setting the date for the Christian Holy Day of Easter, which depends on the last full moon (as calculated by a somewhat inaccurate formula) on or before the Equinox on March 21 (which is also somewhat inaccurate). This meaning of blue moon was lost when the editors of the original Farmer's Almanac died. It was recovered only when researchers for Sky & Telescope magazine noticed that the Maine Farmer's Almanac from 1829 to 1937 reported blue moons that did not fit the meaning of the term calendar blue moon described below. (See What's a Blue Moon? In recent times, people have taken to calling a full moon a blue moon based on the Gregorian calendar. By this use of the term, a blue moon is the second of two full moons to occur in the same calendar month. This definition of blue moon originated from a mistake in an article in the 1946 Sky & Telescope magazine, which failed in an attempt to infer the earlier definition used in the original Farmer's Almanac (see above). It was helped to popularity when a Trivial Pursuit question used this as a source for one of its questions. Sky & Telescope discovered the error nearly 60 years later and the magazine printed a retraction and correction. But by the time the correction came, the calendar definition had already come into common use. Because it is so much easier to understand, the "mistaken" calendar-based meaning has stuck. Calendar blue moons occur infrequently, thus using the saying once in a blue moon to describe a rare event is still meaningful. The infrequency of extra moons in a month is because the length of the Gregorian calendar months are all very close to the length of the 29.5306 day period (on average) of the moon's phases: the synodic month, or lunation. Second full moons are possible because every month except February is longer than this period by 1 or 2 days, but the odds are low. One calendar blue moon occurs ‹ on average ‹ every 2.72 years. The next two calendar blue moons (based on UTC) will be on June 30, 2007 (but May 31, 2007 in the Western Hemisphere; see below); and December 31, 2009. Because February (according to UTC) will have no full moon in 2018, January and March will each have a calendar blue moon that year. Occasionally whether a moon is called blue depends on the time zone. Any full moon occurs simultaneously everywhere, but at that moment clocks and calendars are not the same. For example, when it is early evening on August 31 in Europe, it is already early morning September 1 in Australia. Hence, residents of London seeing a full moon when their clocks and calendar say it is August 31 would call what they see a calendar blue moon. People seeing the same full moon from Sydney would note by their clocks and calendar that it is the early morning of September 1, and they would not term it a blue moon. Because this is confusing, astronomers worldwide and the calendar makers who rely on them typically choose the time zone of the Royal Greenwich Observatory, in England, or the nearly identical UTC time zone. As a practical matter, because the moon seems to the casual viewer to be full for almost three days, the use of a foreign time zone for calendar markings for full moons makes little practical difference. When you ask someone: "what is a blue moon?" the chances are ten to one that you'll get the answer: "When you have two full moons in one month". If we use this definition, then we have a blue moon approximately ever 2.7 years. Having two blue moons per year is extremely rare, the full moon then skips a month. This happens only three to four times per century. Two blue moons per year always fall in January and March, as Febuary with its 28 days is the only months short enough to not contain a full moon. This year 1999, we have two blue moons. The second full moon in a month has just the same color as always. It does not turn blue at all. So why do people call this a blue moon? Can the moon really turn blue? There are several definitions of 'blue moon'. 1. Four hundred years ago, if someone said, "He would argue the moon was blue," it would be understood as, "He'd argue that black is white." 2. Also long ago, 'blue moon' was synonym for 'absurd'. "When the moon turns blue", would be similar to the expression "when pigs fly". It was so absurd that it would never happen. 3. In astronomy, we have a blue moon when certain types of dust and smoke from volcanoes or forest fires absorb red light. When this happens, the moon and the sun get a blue tint. This however is a very rare phenomenon. It happened in 1883 when the Indonesian volcano Krakatoa exploded, in 1927 when a late monsoon in India set up conditions for a blue moon and in 1951 when huge forest fires in Alberta threw smoke particles up into the sky. 4. The phrase "once in a blue moon" means, that an event is fairly infrequent, but not quite regular enough to pinpoint. 5. There are popular songs in which "blue moon" is a symbol of sadness and loneliness. 6. In recent years, the less scientific, but more popular definition of the blue moon has become widespread, namely that it is the second full moon within one month. This new meaning has mainly become popular through the Trivial Pursuit game in 1986. Ever since this definition has been the most widely used. So which version is correct? Officially, the third definition, the astronomical one, is correct. 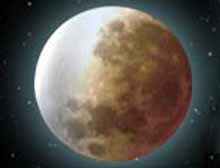 The sixth definition, the two full moons in one month variety, may appeal to many people, but has no roots in folklore. But as this popular definition is now so widely used, it doesn't make sense to ignore it in favour of the astronomical description. When people claim that the 'second full moon' definition is wrong, then they are technically correct. Language is a dynamic medium however. So when enough people use a false expression, it will in time become correct. Therefore, at this moment, it is not more than logical to state that a 'blue moon' is a rare astronomical phenomenon, but also an occurence of two full moons within one month. According to an article in the May 1999 issue of Sky and Telescope, the traditional definition of a Blue Moon is the third Full Moon in a season which has four Full Moons. Compilers of almanacs such as the Maine Farmer's Almanac would use a coloured symbol to denote this third Full Moon, hence the name. Astronomers define the start of each season according to the actual position of the Sun in its annual journey against the fixed stars. This leads to seasons of unequal length, since the Earth's orbit is not circular. The northern-hemisphere Spring and Summer are slightly longer than Autumn and Winter, so a traditional Blue Moon is more likely to occur in Spring or Summer. The Maine Farmer's Almanac, by contrast, defined the start of each season according to a quantity known as the Right Ascension of the Mean Sun. As its name suggests, this is based on an idealised, fictional Sun which moves at a uniform speed, giving seasons of equal length. Since there are two definitions of the start of the seasons, the dates of the traditional Blue Moons can sometimes be different, depending on whether you adopt the astronomical definition or follow the Maine Farmer's Almanac. In the tables below, we give the dates and times of the traditional Blue Moons using both definitions. If a date and time span both columns, then the two methods yield the same Blue Moon. All dates and times are Greenwich Mean Time. When you hear someone say "Once in a Blue Moon…" you know what they mean: Rare. Seldom. Maybe even absurd. After all, when was the last time you saw the moon turn blue?